Buy The Prisoners Diaries, and for a limited time, get Towards a New Liberation Theology free. We hope you had a blessed and safe Eid this week inshaAllah. IHRC has been busy looking at different issues and organising events. In the UK, a demonised discussion about Muslim schools and the hijab, has dominated the headlines. We also distributed 600 Eid packs to prisoners in the UK. Thank you everyone for your donations and support. On our website this week, we cover that issue and much more, including the launch of the report of the universal Justice Network Report into Allegations of Sectarianism in Indonesia. Elsewhere, we have been uploading videos of past events, from short interviews with veterans from the Irish struggle to author evenings from the IHRC Bookshop. We are also busy organising more events, starting with this weekend’s two Decolonising the Mind courses in London, and a storytelling session with Zainab Zahra for children, continuing with an evening with acclaimed creative Mark Gonzales, and the return of Professor Ramon Grosfoguel to IHRC (full details below). We will also be holding a panel discussion in Istanbul on the situation in Egypt. Or call the IHRC office on +44 20 8904 4222 between 9am – 5pm UK time, Monday to Friday and 10am – 6pm on Saturdays. 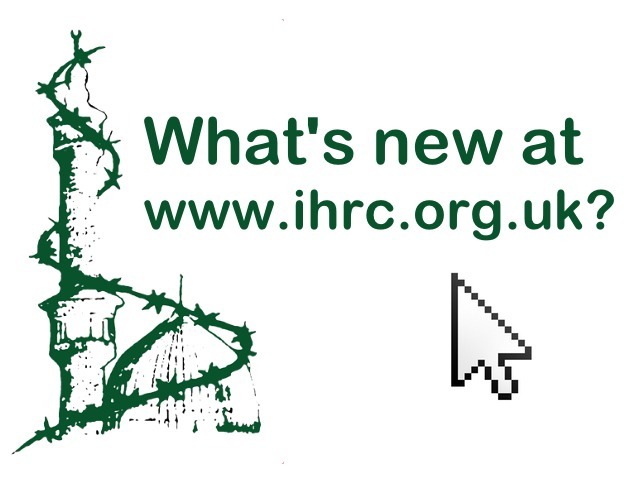 Don’t forget you can follow us on Facebook, Twitter @ihrc or our Youtube channel IHRCtv. The Assata-Tupac Liberation School and Soas2 (School of Occidental and Aryan Studies) are partnering up with the co-operation of the Islamic Human Rights Commission to deliver a unique and educational service. There are 30 places only and the course starts on 22 October, so book now. The Center for the Study of Intercultural Dialogues (Granada, Spain) http://www.dialogoglobal.com/granada is now accepting applications for the 2014 two-week summer institute, Critical Muslim Studies: Decolonial Struggles, Theology of Liberation and Islamic Revival. The faculty includes Tariq Ramadan, Houria Bouteldja, Ramon Grosfoguel and IHRC’s Arzu Merali. The report of the UJN’s fact-finding mission, complete with recommendations is published here. UJN sent a delegation to Indonesia in January 2013. IHRC organised a side panel in Geneva at the United Nations to discuss the situation post-coup in Egypt. Read the report and watch the video here. Zainab Zahra reads her new story with original illustrations about the travels of the young Che Guevara. Suitable for children up to age 9. Do you remember the so called Ricin plot from 2003? Listen to the former jury foreman, Lawrence Archer, from that trial talk about the truth of the case and the awful demonisation and persecution of innocent men. Eibhlin Glenholmes talks to IHRC about the lessons of the struggles in the north of Ireland in 2010. Clara O’Reilly talks through the similarities between the struggles of families and survivors of British state terror in the north of Ireland and relates it to issues facing Muslims in the UK today under the War on Terror laws and discourse.